The proliferation of touchscreen devices has made soft keyboards a routine part of life. 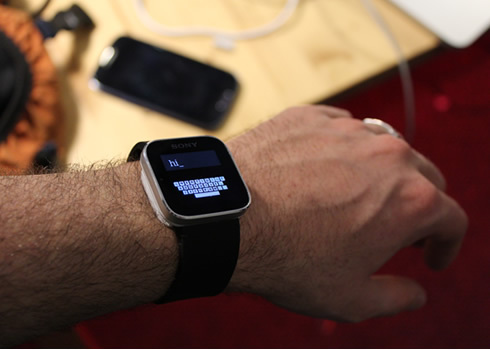 However, ultra-small computing platforms like the Sony SmartWatch and Apple iPod Nano lack a means of text entry. This limits their potential, despite the fact they are capable computers. In this work, we present a soft keyboard interaction technique called ZoomBoard that enables text entry on ultra-small devices. Our approach uses iterative zooming to enlarge otherwise impossibly tiny keys to comfortable size. We based our design on a QWERTY layout, so that it is immediately familiar to users and leverages existing skill. 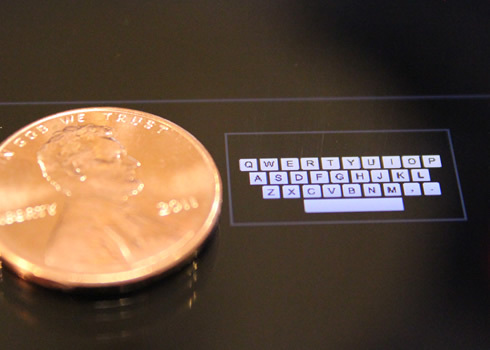 As the ultimate test, we ran a text entry experiment on a keyboard measuring just 16 x 6mm – smaller than a US penny. Users achieved roughly 10 words per minute, allowing users to enter phone numbers and searches such as "closest pizza" and "directions home" both quickly and quietly. Oney, S., Harrison, C., Ogan, A. and Wiese, J. ZoomBoard: A Diminutive QWERTY Soft Keyboard Using Iterative Zooming for Ultra-Small Devices. In Proceedings of the 31st Annual SIGCHI Conference on Human Factors in Computing Systems (Paris, France, April 27 - May 2, 2013). CHI '13. ACM, New York, NY. 2799-2802.